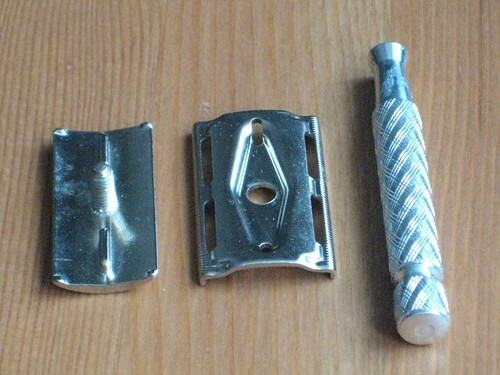 The Gillette Tech describes a variety of razors made over what I understand to be a fair few years. 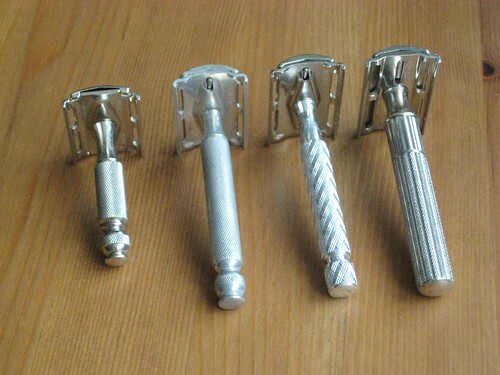 They aren't all exactly the same and have subtle differences that can completely alter a shave. In no particular order I'll be discussing the Travel Tech (USA version), the Ball-Ended Tech (UK), the Aluminium (slim) Handled (UK) and the Fat Handled (also UK)*. As you can see the handle is about 2/3 of the size of a standard safety razor which allows it to be packed away in a case roughly the size of a pack of blades. The most noticeable difference is the lack of blade guides on the upper part of the head. The other techs all feature some sort of rail to ensure the head and blade remain aligned, whereas the USA model has 4 posts on the top part and corresponding gaps in the middle of the razor. This makes the blades slightly easier to change and I have never had a problem with blade alignment. The other difference is head shape - the curve of the top is actually slightly different to the other techs, making the head of the razor a little thicker. This makes it a bit less nimble around fiddly areas such as under the nose, but the added thickness makes it easier for me a get a perfect blade angle every time with this razor. As with all techs this one isn't aggressive in the slightest - something I find excellent. The ball-ended tech has seen a lot more use and abuse (in fact the alu-handled has never been used) which makes it appear lighter in colour - this is just an effect of the photography. Both would have had the same Gillette logo etched into the top (unlike the embossed logo on the travel tech) although in the light of these photos neither really show it off! 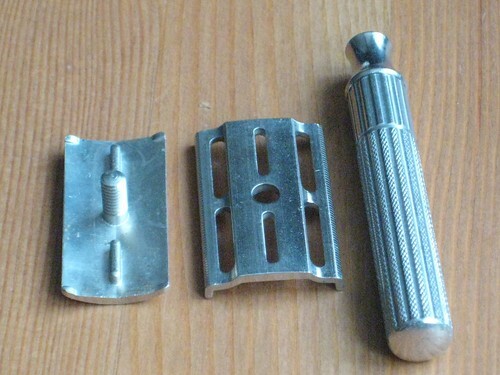 Both razors use a rail to align the blade, with the older ball-ended tech having a complete rail and the newer version having rails at each end. The difference is negligable. The thin-ness of the head and the lightness of the razor overall make this tech a very gentle razor in every sense (the travel tech seems to be plated, making it heaver than these two combined!) but that shouldn't put you off. 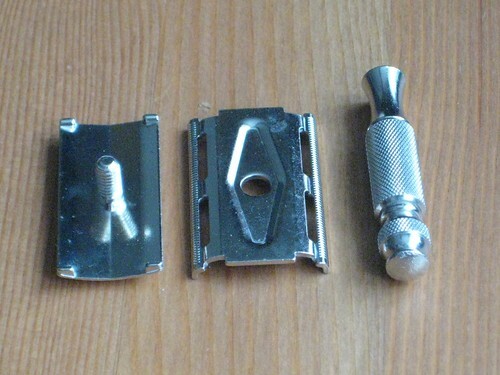 I've always had excellent shaves from this style of tech and I consider them to be ideal razors for anyone starting out, or for those who want a reliable everyday razor. 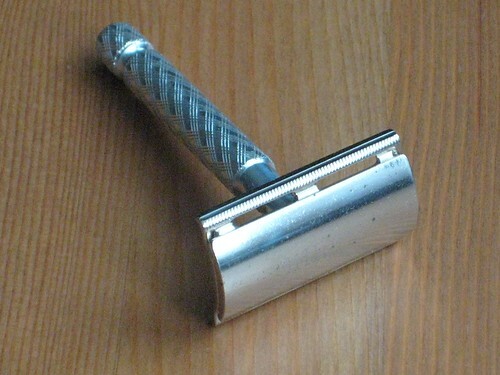 This razor is by the largest of the four, not just in handle but also in head. The upper two parts of the razor are thicker and heavier than the other techs, and the blade guard is wider. This makes for much less nimble shave. The advantage to all this extra metal? 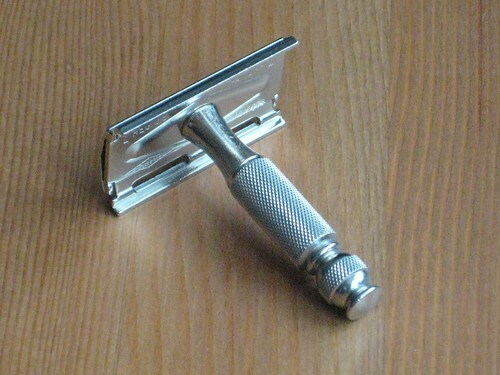 Weight - by having so much more weight in the hand this razor shaves in a different manner altogether. The extra heft gives a more effortless shave and coupled with the customary gentleness of a tech, creates a very smooth feeling shave. The photos don't easily show the solidarity of the fat-handled tech compared with the others - the extra width and thickness (only about 1mm) of the head make a significant difference, and I could easily see this razor working well with a variety of blades that may not suite the other three. That said - this razor has given me one or two very serious nicks, largely due to my own inexperience with a chunkier razor. 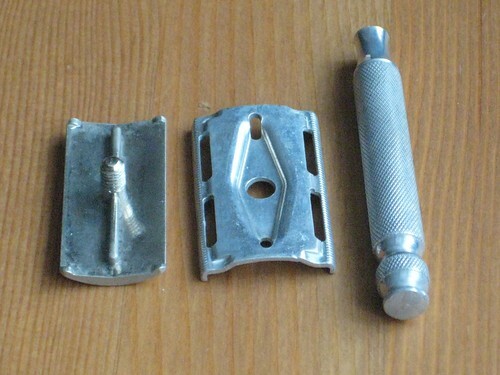 There are numerous other types of techs, as well as other Gillette three-piece razors from the same era and I'm by no means an expert. If you're interested in techs that can be very inexpensive. I've bought them as cheaply as 99p on ebay and in shaving sets for under Â£10. I would happily recommend a tech to anyone who's looking for a simple DE razor, or a travel razor to stick in a toiletries bag. I can certainly see another few decades of use in even the worst condition in my little collection, making it a worthwhile addition to any rotation. Thanks for that monograph Chris: very interesting. I gave one of the aluminium Techs to a friend recently, and he's put it away for his son for when he starts shaving. I was really pleased, and the lad will be off to a good start. Job well done. Is there a Shave Wiki to file that in. 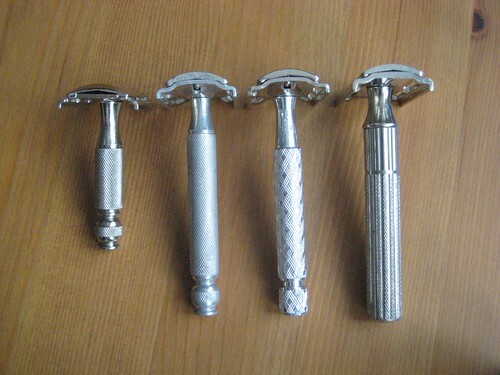 I have 3 Techs: A Gold Plated Ball-end, and Alumium Tech and a Fat handled - all are lovely shavers. I usually recommend that n00bs start with a Tech. 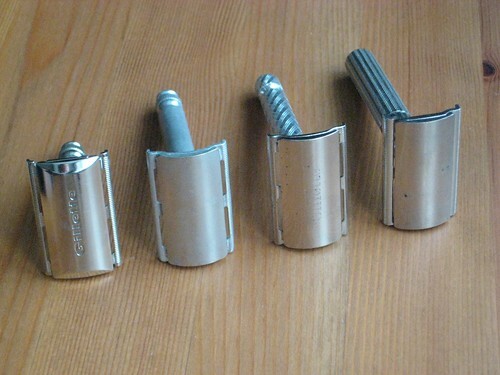 Lovely Razors and thanks for the review. I am desperate to find a mint/near mint ball end tech. Old shaving kits / grooming sets are great sources of Techs. Lots of 'em of the Bay, often the razors are mint/unsused. Worth a look. You then get the chrome storage tubes etc for "free". Actually, one of the nice things about Techs is that even in bad shape they can still be good shavers! My first one (the ball-ended one above) wasn't exactly pristine - that's part of the charm! Yes indeed, hear hear for the humble Tech. Good write up that summarises them quite well. 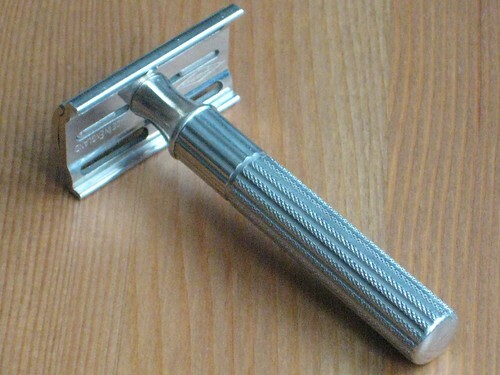 I only have one Tech I held onto which was an aluminum handled Tech it is a fantastic little razor. That travel tech looks amazing. Id love one. I take it its quite light weight? But the increased size makes the fat handled tecb appear heavier - given how cheap they are you may just want to try both! I have a ball end Tech and a gold Fat Handle in my collection. The Fat Handle, together with a Feather, is my goto combination when using a DE. At the moment though I'm enjoying a spell with my Schick Injector SE. This will be a review for the fat handle Tech from the 1940s-50s period. The fat handle version is 10 grams lighter than most ball end types, and they may not shave quite the same. 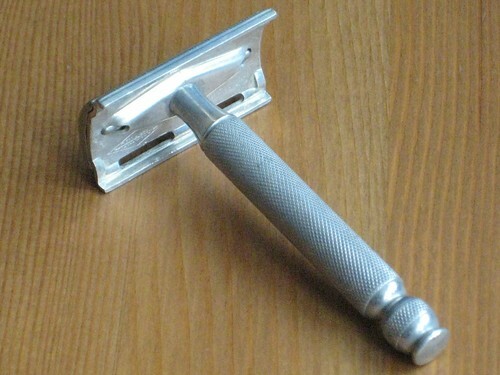 This razor is extremely easy to figure out as far as the proper angle. The head design seems more forgiving and intuitive than many other types, with plenty of room for error if needed. 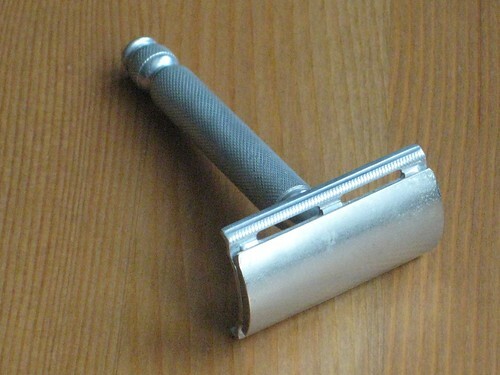 I wouldn't call this an especially mild razor though, since some attention to detail is important with one of these. To me it feels like #4-5 on the Gillette adjustable scale. Maybe just a tad less bite than most other fixed head types. 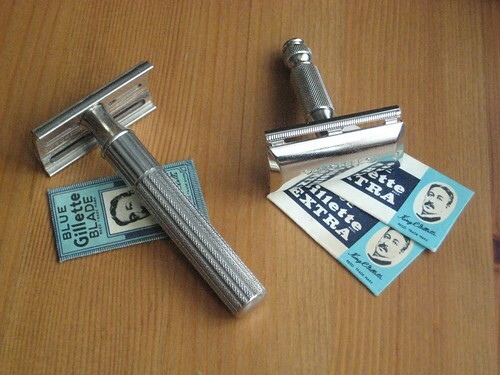 I like a thin head profile on some razors (mild ones), and the Tech is a perfect example. Easy to waltz around my face and no problem getting the hard to reach spots. Very nice feature that my fatboy doesn't have. 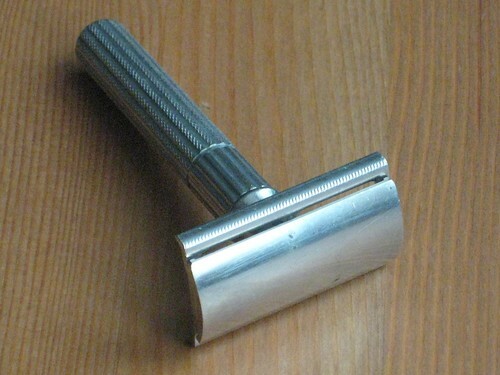 I'd consider this razor to be somewhat handle heavy, but not enough to require much technique tweaking. Normally I prefer something with a bit more weight to the head, which I find helps keep any extra needed pressure to a minimum. That extra help is one additional variable I prefer not to deal with, but it's no problem using the Tech. Going from using a fatboy is quite easy and just takes a little adjustment to keep from bearing down too much going over those tough spots. The Tech shave itself is a close and comfortable one........easily as close as my fatboy set on #4. I'd recommend giving one of these a try sometime. I've since noticed that all US and Canadian 'fat handle' Techs have the more common diamond head (pic 1 of dodgy's post) that was later also made in the UK. <!-- m --><a class="postlink" href="http://www.mr-razor.com/Rasierer/Tech/1940s%20british%20Tech%20red%20case.JPG" onclick="window.open(this.href);return false;">http://www.mr-razor.com/Rasierer/Tech/1 ... 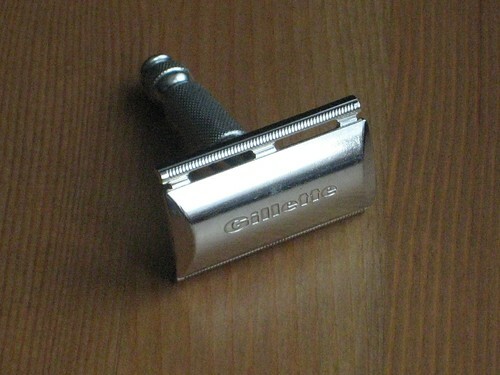 20case.JPG</a><!-- m -->"
Therefore, by rights, there should be no difference in shave between a US fat handle and any other Tech. Only the UK fat handle differs. I noticed my Alu Tech has a very light weight "retaining base plate bit" compared to the thick handle tech. The Alu is correspondingly a lot less aggressive than the Thick. The Alu's "retaining base plate bit" looks like it is made from very cheap Alu actually. The Thick's bit looks like it is steel maybe? (Thats all based on memory, I only have the Alu with me at the moment). 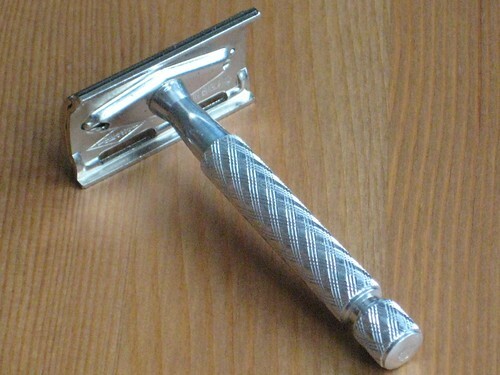 After my grandfather died, I inherited his Gillette razor, complete with bakelite case - at the time I was just a young lad and in the intervening years I tried it out a couple of times and it didn't end well. Anyway, I was raising funds for Movember and had to shave so I pulled the old razor out and tried again, having learnt how to shave with a safety razor... and I love it! There's something quite special about using my granddad's razor, a 1940's Gillette Tech Thin Handle and I really enjoy the whole DE shaving experience.